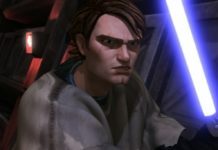 Home TV Star Wars: The Clone Wars Brand New Trailer for The Clone Wars Season Six! During The Clone Wars panel at Star Wars Celebration Chicago 2019, Dave Filoni treated fans to an awesome brand new trailer for the upcoming sixth season of Star Wars: The Clone Wars. Star Wars: The Clone Wars will be returning with 12 all-new episodes on Disney’s direct-to-consumer streaming service. Created by George Lucas, the show first aired in 2008 and became an entry point into Star Wars for an entire generation, following fan-favorites like Anakin Skywalker, Obi-Wan Kenobi, and Padmé Amidala, while introducing major new characters like Jedi Padawan Ahsoka Tano and Captain Rex. Its stories were complex, its heroes and villains were perfectly imperfect, and its look was captivatingly beautiful. It became a multi-Emmy winner and is now regarded as essential Star Wars. Previous articleOuter Rim News – April 12, 2019 The Rise of Skywalker Trailer Breakdown!